The Airgle PurePal AG500 air purifier is ideal for asthma and allergy sufferers looking for relief from irritating airborne pollutants. With a combination of 38 sq. ft. of HEPAfast media and 2.2-lbs. of activated carbon, the AG500 has a filtration efficiency of 99.991% meaning it is powerful enough to remove dust, pollen, dander, unpleasant odors and VOC's. 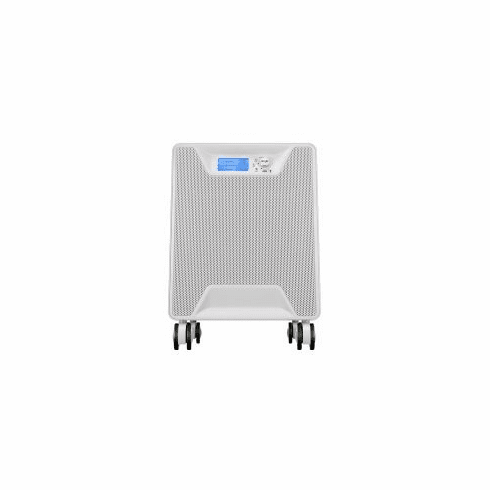 Certified by Energy Star and the Association of Home Appliance Manufacturers, the PurePal AG500 is a general use air purifier ideal for rooms up to 369 sq. ft. The Airgle AG500 has a digital display that monitors the air quality of your room and calculates the life of the filters based on time elapsed and fan speed to let you know when the filters should be changed. The filters are easy to replace, requiring no tools! In Auto Mode, the AG500 will self adjust the fan to the most favorable speed based on the current conditions of the air quality in your room. The Sleep Mode turns the LCD display lights off and changes the fan speed to its lowest setting. The remote control allows you to conveniently navigate through the controls. Casters allow you to move the AG500 unit from room to room with ease. The aluminum housing is stronger that plastic and easy to clean. The gas/odor filter should be checked every month and vacuumed as necessary. Both filters, on average, need full replacement every 8-12 months. The Airgle PurePal AG500 air purifier works by drawing air through a rear intake grill and through a Gas & Odor filter containing 2.2-lbs of activated carbon to remove large particles, pet/cooking odors and VOC's, like benzene, building material vapors, paint fumes. The air then moves through 38 sq. ft. of HEPAfast filter media that it traps 6 times more pollutants than other HEPA filters. The HEPAfast filter will eliminate smaller particles like smoke, mites, pollen, dander and other particles (down to 0.3 microns). Clean air is returned to your room through a front air outlet with no ozone byproducts.